According to PeopleForBikes, 31.5 percent of Washington D.C.’s Capital Bikeshare riders reported a reduction in stress levels. Meanwhile, Climate Central reports that Denver’s B-Cycle program is estimated to have avoided over 1 million pounds of CO2 emissions. It’s no longer necessary to own a bike or spend a small fortune renting one while on vacation. Bike-sharing programs are becoming increasingly popular across around the world. City dwellers can skip the car, bus and subway by hopping on a bike instead. B-Cycle offers a far-reaching ride-sharing program in urban centers, such as Madison, Indianapolis, Philadelphia and Savannah. Bikers purchase a 24-hour membership through a B-station kiosk and unlock a selected bike. Meanwhile, bike-riding locals can become members or pick up a B-card to instantly unlock a bike. The B-Cycle app helps identify which stations are the most practical for users’ routes and where to start their membership to take a ride through the city. Chicago’s bike-sharing system, Divvy, offers 4,760 bikes and 478 stations around the city. The program aims to make affordable bikes available 24 hours a day, 365 days a year with plenty of docking points to make renting and returning them simple. Unlike many private bike-sharing programs, Divvy is part of the Chicago Department of Transportation and operated by Motivate, a large-scale bike-share system. The program received federal grants and initial funding for being a project that encourages economic recovery, lessens traffic congestion and improves the air quality. So far the Chicago community has been enthusiastic about Divvy and shown the growing demand for bike shares in the city. In less than two months, riders made 150,000 trips and rode over 458,000 miles. Citi Bike expands the transportation options in New York City from the subway, bus, cabs and a dense tangle of cars. As more bike lanes have been built around Manhattan and the surrounding boroughs, biking has become a popular transportation option. 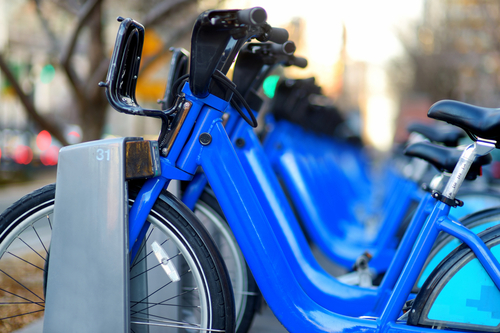 Bikers can download the Citi Bike app or use their smartphone’s GPS to find nearby stations and purchase an annual or short-term membership. The stations are strategically placed based on the surrounding population’s transit needs. Despite the wealth of transportation options in New York, the streets and sidewalks are crowded and new bike lanes lessen their infrastructure load while getting people where they need to go. Bay Area Bike Share in San Francisco logged over 500,000 total trips as of May 31, 2015. Currently, its bike sharing system has over 700 bikes with 70 stations. And, like Divvy in Chicago, it is operated by Motivate. Bikers can download the app to find nearby bike stations or go online to suggest a station location as the program continues to grow across the city. Bay Area Bikes gets into the spirit with rainbow-colored Pride Bikes and a Bike to Work Day complete with complimentary breakfast for its bikers. More bike paths are being added to my city. Coming from Europe where it’s always been part of life it thrills me to know it’s increasing in the Americas. Good article. Bike shares in general are a great idea and I fully support them. I wonder what the finances look like for these programs compared to buses, trains, etc in the long term. I bet we’d see more bike programs pop up (and biker friendly streets) if it lowered taxes. These bike systems are amazing! When i was in paris, i found this such a breath of fresh air. And it’s such a great way to get tourists and locals alike to stop using motorized transport. i don’t know why they don’t do it in ALL western cities where they can afford to? !